The first stop is Mui Ne. Beach, resorts, fishing villatge and sand dunes. The second stop is Na Trangh. Turístic city with big hotels and apartments next to the beach. If you just go 200 metres away from the coast, the city changes completly. A walk to the chong Rocks, the Ponagar Tower and Long Son Pagoda it's enough. Ho Chi Minh City, the old capital of the french Indochina as Saigon. Is plenty of avenues, parks and european style buildings. I can say that I enjoy it. The Fine Arts Museum and the museum of the vietnam war are the perfect complement, and the GuestHouse were we stayed helps to feel like home (My home, 241/43 Pham Ngu Lao St, D1, HCMC). I get into Vietnam from Ha tien (Hà Tiên). Just when get off the bus we meet Fiona and Matt (Scotland & NZ). We visit the city together and we share a room to cut costs... 4 people 10$. After Phnom Penh I go back to the south of cambodja, this time Kampot. Is about 45km to the Vietnam border. Oli and Lili went to Austràlia, and Lucas is coming to Vietnam as well! At the bus we meet a spanish couple from Madrid, Javi and Maria. They want to stay some days in Kampot as well. We stayed in two guesthouses. One chillout style (Bodhi Villa) and one kind of frienly hotel (Poonleu Nath Guest House). I liked Kampot. The city was a french colony and you can still see some buildings of that period. Kampot is famous for his pepper, his sea salt and the durian fruit. The first day we rent a bycicle and we went to see the ocean, the salt fields and Dtray Kho (fish island). The second day was with motorbike... We went to visit a caves (we couldn't find them...) , a lake, Kep city (so much turistic for me...), a beach in a fishing village, one budis temple and the peeper plantations. Saturday at the market. Sunday rains, and I put order to my backpack, I watch a movie and I read. On Monday I'll be in Vietnam. Is not like a marvelous, but for few days is worth. I visit the places where you can imagine how was the years during Khmer Rouge. The Tuol Sleng Genocide Museum (it was the S-21 prision) where they interrogated and tortured more than 14000 people, and The Killing Fields of Choeung Ek an old chinist cementery where the Khmer Rouge killed thousands of people. Also I went to the National Museum of Cambodia and a walk around the riverside. I did the Vietnam visa too. Oli have an old colage from collage living here, Danis. He lives with Smile. They show us the city and bring us to dinner next to the beach. Next morning I go to the beaches by bike. I arrive to the entrance to a national parc. Smile prepares lunch for us. Lucas and I book the tickets to go to Koh Rung Island. The dinner that Smile has prepared is sooo goood! Early morning a van pick us up and bring us to the port to catch the boat. At Koh Rung island there are 3 small fishing villages with wood and bamboo houses. Electricity from 18 to 22h. We stay at the Beach House next to the Dive Shop, a house on the pier with 2 dorms... 3$. Next day I go to dive with the boat. There is big waves and I feel seasickness. Apart of the school there is a english voluntaries group doing a project to preserb the coral reef. I'm realy good in this place! Next day I do the second try to go diving. At the beginning I don't feel the seasickness, but after my first immersion, I do. At the afternoon I go again to the school to help... in that case doing human castles at the water! not bad, no? We have offers of all kinds of transport to travel to Siem Riep (150 Km). we went to the bus station (tourist) terminal to look after more options... Bus 9$ per person, and Taxi for 15$ pp! We do what you have to do in cambodja, Bargain the price. At the end 20$ for 4 by taxi. I stayed in My Home, Raul recommendation. Doble room 10$ with breakfast. Next day I rent a bycicle and I go to visit the Angkor National Museum (10$). Very interesting to understand the history, simbolism of the estructures and shapes before visit the temples. 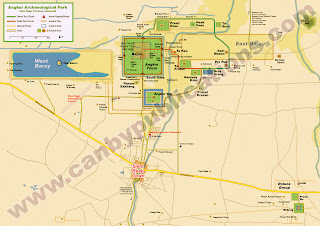 Angkor Archaeological Park is very big (400 km2). Next day I woke up early... 4:30! I take the bycicle and go to buy the three day pass that I can use in one week (40$). After i went to Anghkor Wat temple to see the sunrise. After breakfast time for more bycicle (Roulos Group is about 17 Km far). The sun is getting strong and you have to be carefull of the transit. Just before the firs temple of Roluos Group filming the wheel of my bycicle! I visit the temple and I ask who can help me (I have no tools, and no material). At 30m there is a kind of shop that they sell everything and also repair bycicles! At the end I see myselft on a Tuk-tuk whit the bike on it. Second day with my alarm at 4.30! it worth. The thirt day pass, I start with tree small temples out of the routes and then I do the small Tour with bycicle. The wheater is the tipical of moonson time. Sun all day, except 1 hour rain! I am rest day in Siem Reap, Cambodia (After museums, temples and more temples you have to relax a bit). I was putting photos I've been looking lunches, dinners, parties and gifts before leave. Thank you for being as you are!